Robes are silky soft which gives lavish comfort. A stylish fabric combined with a comfortable feel, designed for both men and women. At Salonwear quality and comfort is not compromised by any means. The luxury and warmth provided by our robe are the best in industry. Hair spa robes available in a wide variety, varying in style and design to meet the needs and challenges of today’s stylist and esthetician. What Makes Salonwear’s Luxury Spa Robes Different from Others? 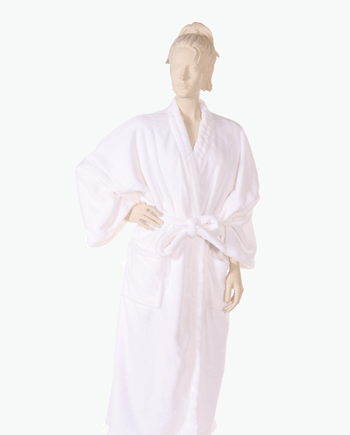 White color spa robe is the largest selling ones! Front facing snap, long, lace tie, full sleeves, are our specialty at Salonwear. Our white waffle weave, spa cuddle fabric and stretch terry fabric spa robes are a customer’s favorite and used all over the country at top salons and spas. Our one size fit all and full coverage design style is a pleasure to wear for clients. A few robe styles work like a cape and gown together having sleeves with Self Gripping Closure or snaps. Buy Men’s & Women’s Spa Robes in Bulk – That Saves a Lot!! We also provide salon apparels, salon wear and spa apparels in bulk. Wholesale spa client robes such as facial client gowns are available at Salonwear. An assorted collection of spa & salon robes transforms any salon or spa into a relaxing place. They are required at multiple places for multiple purposes. Best Spa robes like the Muu-Muu are easy to put on and off feature with a belt tied around the waist to make a perfect fit, drop shoulder sleeves, Off-shoulder neck, this one good looking that is required. Shop bulk apparels in other categories as well such as – salon hair stylist aprons, makeup artist capes, scissor and comb vests at best price, salon hairdressers capes, chic wraps for women and more. To learn more visit our branding page so you can make your spa robes look fabulous!